Acrylic on stretched canvas, 16x16". 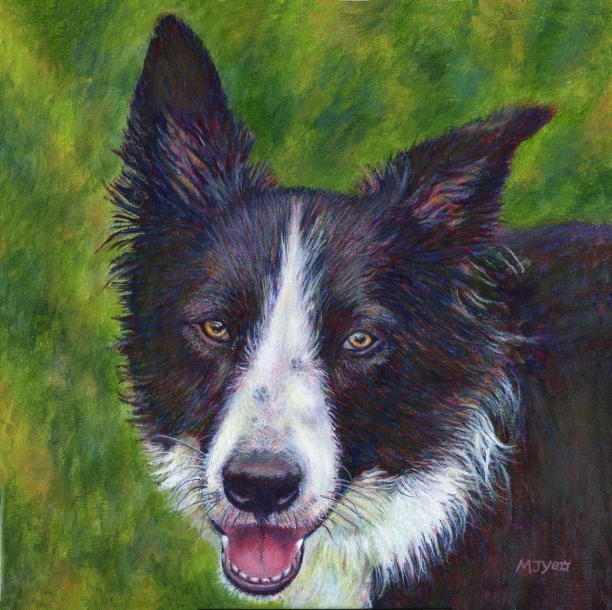 This was a commission for a lady who had great affection for her dog and wanted her personality captured in the painting. From the reference photos I could sense Gyp's affection for her owners too. Pet portrait commissions (from your photos) welcome. £60 (£15 deposit) for 16x12", 12x16" or 16x16". Click to order your pet portrait from my ebay listing. For a deposit of 25% of the final price, I will communicate with you about your requirements/preferences for the painting, produce the painting, then email you a photo of it for you to request any changes you would like made. Once you are happy with it, I will request the remaining balance. When I receive this, I will dispatch the painting to you. It will take 3 to 4 weeks to complete.